Cannabis massage is the perfect way to treat your body to a little TLC. Here’s a DIY guide to help ease tension headaches or muscle cramps. Cannabis topicals are amazing for muscle pain. The herb contains potent anti-inflammatory compounds, which come in handy for tender areas that need a little TLC. Cannabis also is effective at relieving pain and is filled with nutritious antioxidants which help protect your cells from damage. When applied directly to the skin, you get these benefits in a localized area. This means that the herb will give you immediate relief in just the right spot. To help ease a little stress and pain, here are 7 ways to give yourself a cannabis massage. You can easily find infused lotions, oils, or balms at most medical and recreational dispensaries. But, you can also make them yourself. An easy-to-make option that will add an extra level to your cannabis massage that’s great for your skin is cannabis-infused coconut oil. You can find a recipe for it here. First, put some topical on both of your hands. Then, rub the oil or lotion onto the back and sides of your neck without pushing too hard. This serves two purposes. First, it warms up the area for a massage. Second, you begin to work in the anti-inflammatory and pain-fighting oil. You can also rub a bit of oil onto the tops of your shoulders. Keep your shoulders relaxed during this entire process. Next, add a little more oil or lotion onto your thumbs. Interlace your fingers to the webbing and put them behind your head, elbows wide. Tuck the chin slightly to elongate the spine, but keep your back straight. Thumbs should be free and point down. Make sure your chest is open and your elbows are more or less parallel to your shoulders. Again, keep the shoulders relaxed. Use your thumbs to rub up and down along the back sides of your neck. Slowly move them from the base of your shoulders to the spots at the base of the skull. If you notice any tender spots, press into them with the thumbs. Perhaps do a little exploring; move your thumbs around in circles or move them out to the sides a bit to find tender spots. Gently run both of your hands over your face and rub a bit in a circular motion, readying your skin and muscles for a massage. Next, add some oil or lotion to your first two fingertips. Place your middle finger and index fingers one either temple and begin to rub in large, slow, circular motions. Feel around for any tight spots and apply a bit of pressure. Typically, there is a nice trigger point a little above your temples, about a half an inch into the hairline. Typically, there is a nice trigger point a little above your temples, about a half an inch into the hairline. Rub for as long as you want, changing directions. 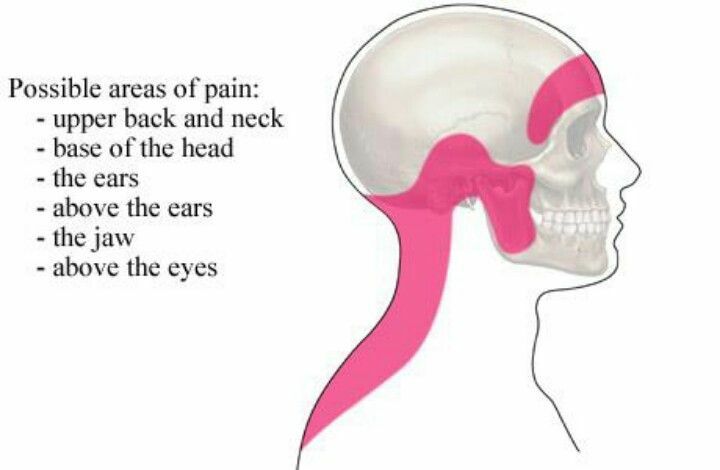 Once you’re through, move down to the upper part of your jaw, where it connects to the skull. Reapply oil to your fingertips if necessary. Continue using your first two fingers to massage in circular motions, or run them downward from the joint to the chin. Keep your jaw nice and relaxed this entire time. From your jaw, move over to the ear slightly. Place the tip of your middle finger right by the targus, the little piece of cartilage that sticks out mid-ear. Rub straight up and down from there. Possibly going up into the hairline about an inch or two. Self-massaging the shoulder area is tricky. It’s super important to keep your shoulders relaxed through the entire process. Otherwise, your risk making the tension worse. To get started, warm up the area by applying a thick layer of oil or lotion using both of your hands. Next, use the tips of your first three fingers to work the muscles back and forth. Use the hand opposite of the shoulder that you’re rubbing. If you’re rubbing your right shoulder with your left hand, avoid tensing the left shoulder. To ease the burden on your left shoulder (and to take the massage a little lower), support your left elbow by gently pushing it up with your right hand. Do the same when you’re massaging your left shoulder with your right arm. Do the same when you’re massaging your left shoulder with your right arm. Reapply topical to your hands as needed. Press into any tight points after you’ve given the area a thorough massage. Liberally apply your topical to the top of your leg, warming up the muscle by gliding your hands all around and rubbing in the topical a bit. You’ll want to be seated on the edge of a chair for these techniques. Let’s start with the quads. Once you’re warmed up, use the heels of your hands to rub up and work them up and down on your quad muscles. You can vary the pressure to whatever feels best for you. Do this for a minute or two. Next, interlace your fingers to the webbing. Place your interlaced fingers over the top of the quad and squeeze while working down. If it feels good, you can start working four hands from side to side while squeezing. Finally, you can switch to using your forearms and elbows. Start by rubbing your elbow to the outside of your quads, and work toward the inside. After a minute or two of this, you can switch to using your forearm to rub up and down like you would a massage stick. Now, for the hamstrings. Make sure your hamstrings are nice and warmed up by rubbing back and forth with a flat hand. Next, interlace your fingers again and squeeze up and down along the hamstring. Roll your hamstring back and forth between your palms. Then, release your hands and use your fingertips to gently work into the hamstrings on either side. Begin near your knee and work up, using a similar rolling motion as when your hands were intertwined. Work into any tender spots. When you’re done, rub your hands up and down your hamstring again. Give the muscle some quick gentle slaps to help it release if needed. Reapply your topical at any point. You can apply similar techniques to your calves. Sit on the floor with the soles of your feet touching. Keep your back straight. If you can’t sit like this with your back straight, sit on a yoga block, firm pillow, or folded blanket. Warm up your feet by quickly yet gently rubbing each of them with your topical. Next, fold forward slightly, and place a hand on each foot. The palms of your hands should be on the tops of your foot, and your thumbs should be in the arch. Grip the tops of your feet with your palms and fingers while you use your thumbs to slide up and down the soles of your feet. You can be pretty liberal here, massaging in whatever way feels best. When you get to a tender spot, gently push into it until you feel a release or shift. After all of this massaging, don’t forget about your hands! Slather your topical all over your hands. Rub them together a little bit. Next, begin to work the thumb of your right hand into the fleshy palm of the left. A good place to squeeze is right between the thumb and index fingers. Squeeze and pull your left fingers upward with the thumb and fingers of the right hand. Pause and squeeze each fingertip. Repeat with your other hand. Stretch out your hands by extending your arm straight in front of you hands pointing down. Use the opposite hand to gently pull your fingers back and down. Release and roll your wrists around. Repeat with your other hand. When you’re tired, stressed, in pain, or have a headache, topicals can be a lifesaver. Not only do they ease pain and fight inflammation, but pairing them with massage increases blood circulation and relaxes tense, aching muscles. Cannabis-topicals are super-powered oils and lotions. When applied to the skin, and combined with a cannabis massage, they can ease headaches, relieve cramps, and help you feel like yourself again. Do you have any tips for a cannabis massage you want to add? Share them with us on social media or in the comments below. We’d love to hear from you!